The Sainte-Chapelle ("Holy Chapel"), located within the Palais de Justice complex on the Ile de la Cité in the center of Paris, is a diminutive yet perfect example of the Rayonnant Style of Gothic architecture. It was erected by Louis IX, king of France, to house the Crown of Thorns and a fragment of the True Cross, precious relics of the Passion. Louis had purchased these in 1239 from the Byzantine emperor Baldwin II, for the exorbitant sum of 135,000 livres (the chapel "only" cost 40,000 livres to build). Two years later, more relics were brought from Byzantium. While these were temporarily stored in the Saint-Nicolas chapel of the royal palace, Louis set about finding a more suitable space, and commissioned the Sainte-Chapelle to serve as a reliquary casket, albeit enlarged to an architectural scale. In the flamboyant thinking of the 13th century, the idea was to elevate the Kingdom of France to be the leader of Western Christianity. The original plan of the chapel dates from 1241, and is generally attributed to Pierre de Montreuil, who had also rebuilt the apse of the Royal Abbey of Saint-Denis and completed the south façade of Notre-Dame Cathedral in Paris. 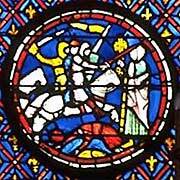 After breaking ground in January of 1246, the Sainte-Chapelle was rapidly constructed, and completed April 25, 1248. On the following day, the upper chapel – serving as both a royal chapel and the place where the relics were to be exhibited – was consecrated by the Pope's legate, Eudes of Châteauroux. The lower chapel – the palace's parish – was dedicated to the Virgin Mary by Pierre Berruyer, Archbishop of Bourges. The structure is 36 m (118 ft) long, 17 m (56 ft) wide, and 42.5 m (139 ft) high. Fronted by a two-story porch, the Sainte-Chapelle has the emphatically vertical proportions of Gothic architecture, which had been perfected during the 12th century. The architectural model is that of a building with a single nave, culminating in a chevet with seven panels. Outside, the design concentrates on the essentials – a sober base and heavy buttresses contrasting with the soaring lightness of the upper parts. The slate roof is dominated by the spire made of cedar, 33 meters (108 ft) high, a masterpiece of finesse, made in the 19th century, but an exact replica of the 15th century spire. The upper chapel is resplendent in its Gothic architecture – light, color, and space blend to inspire a sense of harmony between art and religious faith. Architects, sculptors and painters evidently took the greatest care with the interior of the upper chapel, as this was the part of the building reserved for the king, his close friends and family, as well as for displaying the religious relics. Supported by slender piers, the vaulted ceiling seems to float above magnificent stained-glass windows. Most significant of the sculpted decorations in the upper chapel are the statues of the twelve apostles, which lean on the columns marking the bays. With their flowing dress, finely featured faces and hair in flattened curls, they impart a sense of serenity in all who contemplate them. The holy relics purchased by Saint Louis were kept in a large, richly decorated reliquary, placed at the summit of the open tribune, at the back of the apse. They were exhibited to the faithful each year on Good Friday. 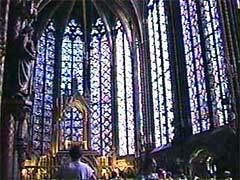 In addition to the Crown of Thorns and a piece of the True Cross, the Sainte-Chapelle's collection of relics included a number of other key pieces mentioned in both Testaments of the Bible. The lower chapel is dedicated to the Virgin Mary, whose statue stands freely next to the central pier of the portal. Low vaulted ceilings rest on fine columns with crocketed capitals, linked by anchor braces made of wood or stone. The walls are decorated with trefoiled arcades and twelve medallions representing the Apostles. French fleurs de lys on an azure background and towers of Castile alternate on the columns. The towers are an homage to Blanche of Castile, Saint Louis' mother. 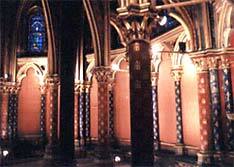 The vaulted ceiling is painted to resemble star-filled heavens, and the floor contains tombstones covering the sepulchres of treasurers and reverends of the Sainte-Chapelle. During the period of the monarchy, the lower chapel was reserved for palace staff. Over the centuries, the Sainte-Chapelle suffered the vicissitudes of time, undergoing all manner of changes during the Ancien Régime. It was damaged by fire in 1630 and again in 1776. The stained glass windows in the Lower Chapel were removed following a flood when the Seine burst its banks in 1690. Perceived as a symbol of both religion and royalty, the Sainte-Chapelle suffered considerable damage as a result of the French Revolution. Its furniture, stalls and choir wall disappeared; the organ built by François Henri Cliquot was transported to Saint-Germain-l'Auxerrois; the spire was knocked down, the tympans damaged, and the holy relics were scattered. Most of the statues were saved by Alexandre Lenoir. Starting in 1837 under the auspices of Eugène Emmanuel Viollet-le-Duc, significant restoration work was undertaken by the architects Félix Duban, Jean Baptiste Lassus and Emile Boeswillwald, and by 1868 the Sainte-Chapelle was returned to its previous splendor. While some of the relics were never to be found again, others are today kept in the treasure of Notre-Dame Cathedral and at the National Library. The building was classified as an Historic National Monument in 1862. Sainte-Chapelle is renowned for its richly hued stained-glass windows, comprising 600 square meters (6,456 sq ft) in area. Two-thirds of the pieces are original works, representing the finest examples of 12th century craftsmanship. Reds and blues are the dominant colors, in contrast with the 15th century western rose window. In these panes the full biblical story of humanity is recounted, from the Creation to redemption through Christ; Genesis, Exodus, Numbers, Deuteronomy, Judges, Isaiah, the Tree of Jesse, Saint John the Baptist, Daniel, Ezekiel, Jeremiah, Tobias, Judith and Job, Esther, the Book of Kings, and the History of the Relics follow one to the next. Each window, divided into arches, reads from left to right and from top to bottom. Following a period of disaffection for the Sainte-Chapelle in 1803, its stained-glass windows were stored in a two-meter space, in order to use the building as a repository for the state's archives. They were admirably restored in the 19th century, then carefully removed during World War II in anticipation of the German invasion of Paris. Following the war, every piece was meticulously replaced. During the past half-century, the effects of air pollution on the stained glass have posed extraordinary challenges to conservationists. Operations to restore and protect the windows have recently been initiated, with support from the Ministry of Culture and the Gaz de France Foundation. Main entrance: 4, boulevard du Palais, 75001 Paris. (see map) Accessability: All. Admission: Adults – €8.50/person, reduced rate €5.50/person, groups of 20+: €6.50/person. FREE admission to minors under age 18, ages 18-25 who are either EU residents (27 countries) or non-EU citizens residing permanently in France, disabled and unemployed persons. One-hour guided visits for 30 available in English, Spanish, French; for group reservations, call 01-53-73-78-52. With one month's notice, a 1.5-hour visit with commentary is also available for groups of 30 in English, French, German, Russian, and Spanish. Hours: Open every day, 9:30 a.m. - 6:00 p.m., March 1 - Oct. 31; 9:00 a.m. - 5:00 p.m., Nov. 1 - Feb. 28; closed Jan. 1, May 1, Dec. 25. Métro: line 4, station Cité. RER: Saint Michel-Notre Dame. Buses: lines 21, 27, 38, 85, 96 and Balabus. By car: follow the banks of the Seine to Châtelet or Saint-Michel, then boulevard du Palais. Edited by Ian C. Mills, © 2002- – All Rights Reserved. Sources: Christopher Mead, Department of Art History, University of Pennsylvania, Philadelphia, PA.   (2001 Grolier Multimedia Encyclopedia, © 2000 Grolier Interactive Inc.). Paris Court of Appeals web site. Centre des Monuments Nationaux web site. All Rights Reserved. Bibliography: Jean Bony, French Gothic Architecture of the 12th and 13th Centuries (1982); Paul Crossley and Paul Frankl, Gothic Architecture (2001); Louis Grodecki and Roland Recht, Gothic Architecture (1985). Relevant publications: Robin S. Oggins, Cathedrals (1996). Otto von Simson, The Gothic Cathedral: Origins of Gothic Architecture & the Medieval Concept of Order (1988). Stan Parry, Great Gothic Cathedrals of France (2001). 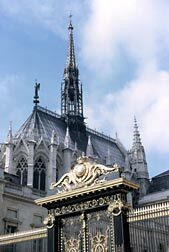 Images: Sainte-Chapelle seen from Palais de Justice gate, © 1968- Ian C. Mills, webmaster of DiscoverFrance.net – All Rights Reserved. Upper chapel of Sainte-Chapelle, from Romanesque and Gothic France, © Christopher Callahan, Associate Professor of French/Spanish, Illinois Wesleyan University, Bloomington, IL – All Rights Reserved. Lower chapel of Sainte-Chapelle, from Paris Cathedrals, © Jane Raley – All Rights Reserved. Detail of roundel from stained glass lancet-window, © Art Images for College Teaching, Department of Art History, Universiy of Minnesota, Minneapolis, MN – All Rights Reserved.